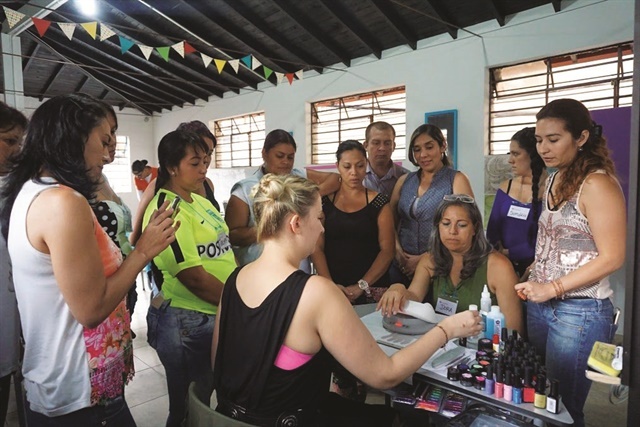 Eager to “pay it forward” and help the next generation of nail techs, celebrated New York City-based nail artist Fleury Rose took her passion for nails a continent away to give women in Medellin, Colombia, a “hand-up” toward achieving emotional and financial independence. 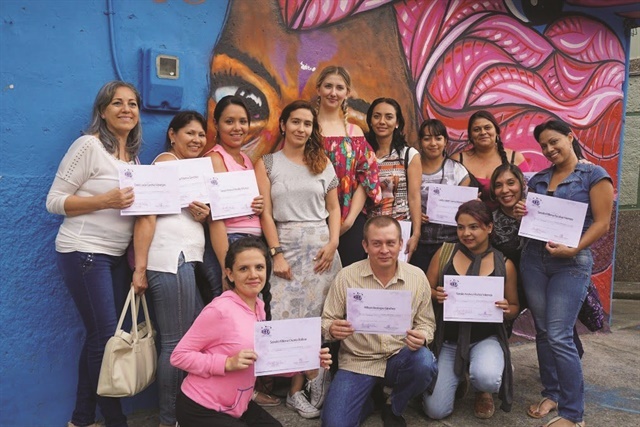 She trekked to Comuna 13, one of Medellin’s most underprivileged neighborhoods, to help empower women struggling to support themselves and their families by teaching them professional nail care techniques. Rose worked closely with the CadaVida Foundation, a non-profit focused on empowering single mothers to unleash their potential. Reema encouraged Rose to attend the THNK conference in Amsterdam, and wrote THNK organizers a recommendation. At THNK, Rose met another advocate for improving women’s lives — Viviana Cadavid Orrego, founder of the CadaVida Foundation. Rose was intrigued by Orrego’s efforts to help women create better lives and wanted to contribute. In April, Rose set off for a week-long trip to Colombia with the goal of helping women improve both their nail skills and their lives. And while she was on-site providing education and inspiration, a village of beauty influencers championed her efforts. CND donated more than 10 full sets of Shellac along with LED lamps and other products. 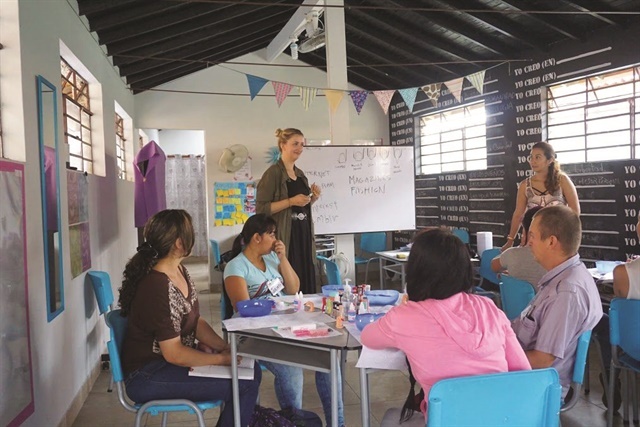 The Beauty Changes Lives Foundation contacted Milady, a part of Cengage Learning, which generously donated Spanish-language versions of the Milady Standard Nail Technology textbook. Classes began with the basics, as women learned how to perform a proper manicure. Rose began with polish, moved to gels, and eventually got into design. Nail art was a skill the women were especially excited to learn. “Nail art is more primitive in Colombia and it’s not considered an upscale element of fashion like in the U.S.,” says Rose. As the women’s confidence grew, so did their expertise, moving to lace patterns, thematic concepts, and modern designs. “I gave the women some homework and the next morning they were so excited to share what they had learned,” says Rose. The women also learned systems to work more efficiently and to market their nail services. Rose covered marketing via social media, building a portfolio, and upselling services. She also encouraged women to see the many career paths available to a nail professional. While nail services are common in Colombia, the career is not marked by the education and licensing that distinguishes nail professionals in North America. “The women started seeing this career can be so much more — that they can use their imagination and drive to create a new product line or achieve other dreams,” she says. Rose knows firsthand the power of nails to change a life. Growing up in a family with few financial resources, she loved art, beauty, and fashion. A career in the nail industry allowed her to follow her passion while creating a rewarding career. “Fleury is living proof that beauty really does change lives,” says Lynelle Lynch, president of the Beauty Changes Lives Foundation. Without a system for education and licensing, nail professionals in Columbia often find themselves outside of the formal economy and caught in a cycle of poverty. In response, the CadaVida Foundation launched the ColorGlam project. ColorGlam aims to provide manicurists with steady, fairly-paid job opportunities, bringing them into the formal economy. A portion of the revenue the platform realizes will be reinvested back into the local community, supporting training and helping women start their own micro-businesses. For more information, go to www.cadavida.org.